Why does a politician in the Northeast vote for a bailout of car makers in the Midwest? What does low corn production mean to the price of a can of soda? Why do men, on average, earn more than women? The answers to these questions, and so many more, can be found by studying economics — a social science that has helped people answer big questions for centuries. 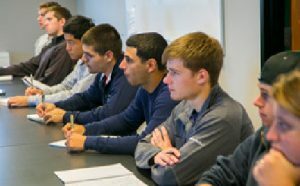 While the focus of an economics education is centered on the production, distribution, and consumption of goods and services, our program takes pride in being well-rounded — a fitting approach to a discipline with deep roots in the liberal arts. Yes, you’ll learn about business analysis, economic forecasting, and probability theory. You’ll also hone your writing skills, enhance your reading and listening capabilities, and develop your ability to think creatively—in short, you’ll be in demand after you graduate.